He's a homeless guy who battles the forces of evil in a fantasy world (naturally). He also appeared on MTV's "Oddities" show. Copyright 1995? Image Comics, all rights reserved, blah blah blah. Who cares. This is the only comic book I've ever liked. The artwork is amazingly good, and the storyline, while fragmented and difficult to follow, is compelling. 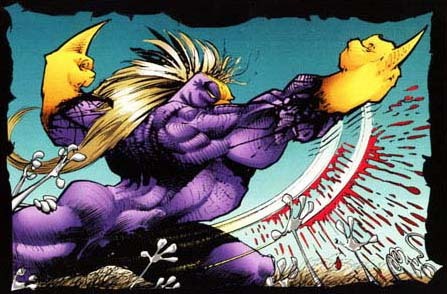 The Maxx is a comic book about a guy who after getting hit by a car, starts to think he is a superhero by the name of the Maxx, here to protect the jungle queen. This jungle queen is actually a social worker by the name Julie Winters. It is a really weird comic with a story that keeps getting more and more messed up as it goes. Oh yeah, I almost forgot to mention the villain. His name is Mr. Gone. His name has a hidden meaning which I won't give away in case you want to read it. As an avid comic book collector, I can tell you that comic book collecting is a fun and exciting hobby. More and more people discover collecting comic books everyday. Many people discover comic books because of the media. Newspapers, radio and television tell of conventions, cartoonists and rare old issues. Magazines publish articles about the comic book industry, and many even review the comic books themselves. Libraries even carry comic books in their collections. The first is the traditional audience familiar to everyone: the kid who takes his/her weekly allowance to the local comic book store and buys comic books about popular super heros. With the gradual decrease of brick and mortar comic book stores and the virtual elimination of comic book racks at newsstands and stores, kids are starting to look elsewhere to buy their comic books - namely online. The second is the comic book collector: the more sophisticated reader, who maintains, preserves, evaluates and files a growing comic book collection, often of complex material that would baffle a young reader. The average comic book collector is old enough to vote and maintains a full-time job.